We are putting samples of homemade granola in your box this week. As you read this blog, Cindy Dollar, a local Goleta chef is making samples of Raisin Pecan granola for you to try out. The granola will be offered once a month in 13-oz bags for $12.95/ea. Each month there will be a new flavor offered and you can check out the CSA store to see what it is. The granola is organic and will be made fresh to order. I’ve tried this granola and it’s highly addictive, a great healthy snack and your kids will LOVE it. Let me know if you have any questions. We will begin taking orders immediately for delivery next week so definitely let me know what you think! Purchasing this granola (and all items in our store) will directly support your local community. This entry was posted in Uncategorized on March 31, 2014 by Carolyn. Follow us on instagram to see daily farm pics. This entry was posted in Uncategorized on March 25, 2014 by Carolyn. CSA and Juice for March 19th Berries! This entry was posted in Uncategorized on March 18, 2014 by Carolyn. Have you ever had a Kenny Grapefruit grown right in your backyard? Sweet and delicious like an orange, but with the same bite as a grapefruit. These were grown right here in Goleta, at Vincent Farms. 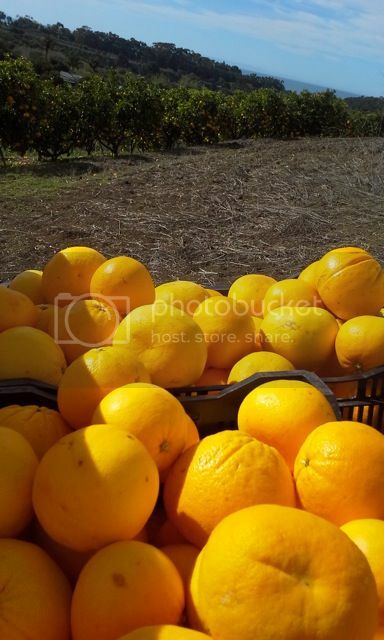 Check out the picture that they took with the grapefruits in the forefront and the actual trees in the background. They are super sweet and juicy. They can be eaten like a grapefruit for breakfast, peeled like an orange for a snack or juiced! This entry was posted in Uncategorized on March 11, 2014 by Carolyn. What a weekend! We received over 5 and 1/2 inches of rain and the farm looks very green today. Most of the rain came on Saturday which caused extreme hardship in picking for all our markets for Sunday. We visit 9 markets so there’s a lot of vegetables to be picked. It’s the first week for strawberries, but eat them up when you receive them as they are one of the few things on the farm that don’t do well with rain. We are doing our best to sort out any bad berries, but please note that your strawberries took a shower over the weekend which tends to thin skins and create bruising. They are still extremely sweet and maybe best popped right in the freezer and made into delicious smoothies. This entry was posted in Uncategorized on March 4, 2014 by Carolyn.